Delhi,10 July :Prime Minister Manmohan Singh will seek a vote of confidence "as early as possible" in the wake of Left parties withdrawing support to the Government on the Indo-US nuclear deal and the cabinet would meet on Friday to decide the date for convening the Lok Sabha. 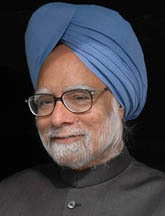 Capping a day of hectic political activities, Dr Singh, who returned from Japan in the small hours of the day, drove to Rashtrapati Bhavan at 7.15 PM and met President Pratibha Patil to convey his desire to seek a trust vote, a demand made by the four Left parties and opposition BJP-led NDA.A Rashtrapati Bhavan communique issued after a 30-minute said, the Prime Minister stated that "he and his cabinet colleagues are keen to seek a vote of confidence as early as possible. "The precise date on which the Lok Sabha will be summoned for the purpose will be communicated to the President by the Prime Minister by tomorrow evening," it said ending speculation over whether the Government would wait for the opposition to move a no-confidence motion. Amidst indication that the special session could be held anytime after 22nd July, small parties whose votes could be valuable in the trial of strength that is expected to be a touch-and-go-affair. This is the first time since 1989 that heralded coalition politics in the country when a Prime Minister is seeking a trust vote after four years in office.The Prime Minister’s meeting with Patil was preceded by a meeting of Congress Core group at his residence in which party President and UPA Chairperson Sonia Gandhi was also among those present.